As I told you on Sunday, Faith Baby is HCO's newest sponsor! I am so very honored and excited that Stephanie has decided to offer you, my super cool readers with a chance to win one of Faith Baby's items (you can choose from a Onesie or a T-shirt). 1. Visit http://www.faithbaby.com/ browse around a bit and come back here and leave a comment here at this post, with what item is your favorite or you would like to win! 3. Tweet this giveaway and be sure to include @faithbabywear or the phrase #faithbabywear in the tweet. Leave the URL of the tweet or your twitter name in a comment on this post. 5. Blog about this giveaway and be sure come back and leave a comment with the URL of the blog post. PLEASE BE SURE YOU HAVE A VALID EMAIL ATTACHED TO YOUR COMMENT OR BLOGGER PROFILE/BLOG! This is how you will be notified. This Giveaway will end Friday September 11, 2009 at 9pm PST. Please try and make each entry a separate comment on this post. It makes it much easier to calculate the winner. If you are curious, I use Random.org to determine my winners! *This is a compensated giveaway. I like the "be patient, God is not finished with me yet"...if baby blue is still sold out, then black on yellow. These are adorable! I would LOVE the "be patient" tee for my ornery son! I'm a new Faith Baby follower! Those are really cute. I need the "be patient" one for my older son. I like the strawberry Mocha headband but I also like the onsie in pink that says "I'm not spoiled, blessed". cute! Oh I need the be patient shirt for my 4 year old...I need the reminder!! These are so cute! My favorite is the "all God's grace in this tiny face" onsie. Thanks for the opportunity to win one of these! Love the headbands!!! Oh so cute!!! I love the "not spoiled, blessed" onesie. ALL of them are so sweet, though! Love the "I'm not crying, I'm praising the Lord" onesie... I'll have to keep that in mind when my new babe arrives!! My favorite is "not spoiled, Blessed"
Forgot to say I am @A_Dunn on my Twitter entry. What a fabulous idea this is! So cute! I think the "be patient one" is one we all could wear. The one that tickled me is "praising the Lord". I love, Love, LOVE the "I'm not crying, I'm praising the Lord" onsie! I like the I am not spoiled I am blessed. It helps to remind us how special our little ones are. love the "not spoiled, blessed" shirt! what cute ideas! My favorites would cover just about everything over there, and though most of the things my daughter could wear the 12-18 month size she would be out of them soon. I pray she makes some of her cute sayings in larger sizes, soon! 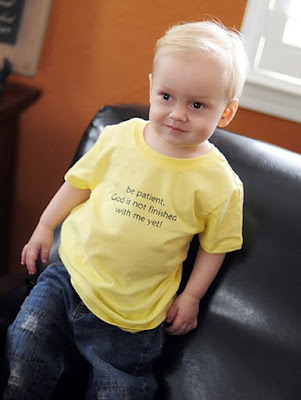 I would love to get my 5 year old son a "be patient" tee, as it is fitting for his autism. Thanks for the great giveaway/linky love to a great Christian product by a Christian woman! I'm following Faith Baby on Twitter @Vindiciti. I have wanted the "Be patient" shirt for a long time!! This would be so fitting for my busy little guy! Thanks for the contest! I became a follower of faith baby! I like the "Not spoiled, blessed" onsie in brown with blue. My favorite? "All God's Grace in This Tiny Face". Perfectly sums up the way I feeling staring into my baby's eyes!!! 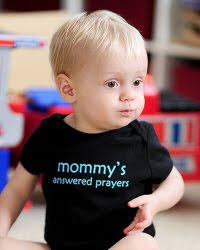 I like the onesie that says, all god's grace in this tiny face. I follow faith baby through google friend connect. I follow faith baby on twitter as fefemarie09. I love the "be patient, God is not finished with me yet!" i need to remember this for my son! I like the "Not Spoiled, Blessed" onesie!! I'm already following them on twitter. I am a follower. Tough decision to choose one, but the "please be patient" Tee is awfully cute!